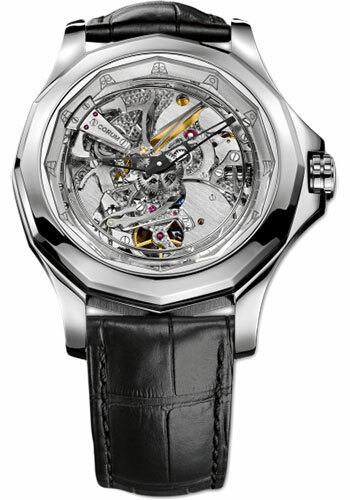 46 mm titanium grade 5 case, sapphire crystal back,minute repeater winding bezel , skeleton dial, hand wound CO 102 movement with hours, minutes, and four-hammer minute repeater (two striking hammers for each chord), approximately 100 hours of power reserve, black crocodile strap with tongue buckle. Water resistant to 30 meters. 14.5inch 5N 18K red gold case, 14.44mm thick, transparent back with glare proof sapphire crystal, 5N 18K red gold bezel, sapphire crystal crystal with anti-reflective treatment, skeleton dial, caliber co 102 hand-wound movement with hours, minutes, minute repeater, approximately 100 hours of power reserve, brown crocodile leather strap, tongue buckle buckle. Water resistant to 3 atm.